Thank you for the well wishes and to the few that have so far have run a bit with me. All support greatly appreciated. Four down with 46 to go as I write this. I hope some might chose to join me running for a while after parkrun on Sat to mark the completion of the first week. Here is the route. Certainly hope to have some company on Sat 23rd July after parkrun. For the last four years local parkrun events have come together at various places to self-organise what became known as ‘longest chains’; seven [usually] 5K parkruns in a single day [sanctioned by, but not organised by, parkrun UK] with time to travel between stages. Regrettably, parkrun UK have decided that they can no longer be involved in any way with such an endeavour going forward, but have given their blessing for individuals to continue what has proven to be a very enjoyable and social day between local parkruns. I therefore invite any interested parties to join me for a day of seven 5K runs, Rebranded as London parkathon [EAST] on 15 June 2014. All details [timings and map] and extra info can be found at this link. After such a successful marathon recruitment I thought I would see if any of you were keen to get involved in Prudential RideLondon on Sunday August 10th It is a super early start of 4.30am at the Olympic Park but you would be done by around 10.30am. As local Sports Makers, qualified Run England leaders and experienced marathon runners, Liz Worrell and Tony Lobo and myself are offering FREE Sunday morning training for anyone currently at the 5K in around 12 minutes per mile pace [or under] level that would like to train for longer distances. We are particularly keen to encourage those that want to attempt their first Half or Full Marathons in 2014. We welcome runners from ANY club or running group or those that are unattached. As an experienced endurance coach and long distance runner I am able to offer training advice and schedules. If anyone was interested in trying to beat last year's time? 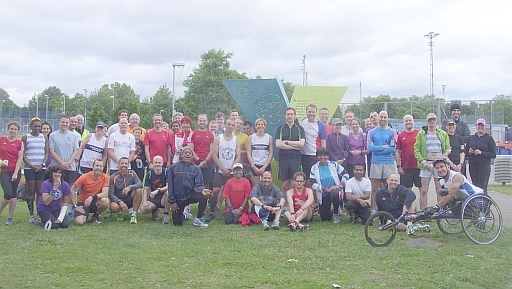 Fantastic fun day out this Sunday with the first running of the East parkrun longest chain in London. Great to have so much support at Wanstead Flats and to see lots of WFlaters continuing on to other stages too. If any runners would like to email in their stages and times we will be happy to collate and post here on the website. Well done all. Here's to next year. ED wanstead Flats / East Chain organiser.